"King of the perennial holly- groves, the riven sand- stone: overlord of the M5 : architect of the historic rampart and ditch, the citadel at Tamworth, the summer hermitage in Holy Cross : guardian of the Welsh Bridge and the Iron Bridge : contractor to the desirable new estates : saltmaster : money- changer : commisioner for oaths : martyrologist : the friend of Charlemagne. 'I liked that', said Offa, 'sing it again.'" Geoffrey Hill. 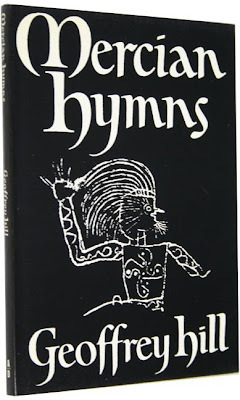 MERCIAN HYMNS. Andre Deutsch, London 1971. I found this book at the bottom of a box this New Year morning. I had read it before in paperback -a collection of 30 prose hymns, the first of which is quoted above. A superb achievement by Hill, possibly his finest work; I had not realised its value until I checked it out and was surprised to find no copy less than $640 and a signed presentation from the author to my old professor at Southampton, the fine Catholic poet F.T. Prince at $2000+. A nice find. The point about the book that most sellers emphasise is that the boards have a tendency to splay and unsplayed copy are prized. Mine was almost completely unsplayed, joy of joys. Whether people step forward eager to buy at £300 is another matter. I am a believer in the old bookseller's maxim 'the right price is the wrong price' and feel that very clean copies probably sells at between £200 and £300 and higher priced copies sit on the web for long tranches of time. It was a rather sad book to find as formerly I would have quoted it to friend and colleague Peter Jolliffe of Ulysses who died over Christmas. Peter was a great dealer, a good poet himself and coincidentally a great admirer of Geoffrey Hill. His favourite poet was probably W.S Graham. He was honest, highly intelligent (Oxford) had great integrity and a sweet nature. A little shy and extremely modest - he was not one of those Oxford guys who keeps reminding you that he went there. He was not old and his health had been compromised for a long time but he had soldiered on uncomplainingly in his Museum street shop. A natural stoic (except in the case of a book missed from a catalogue!) I have an abiding memory of him staying the night at a house my wife and I had rented in the Aptos Hills about 1995 - I offered Peter the sofa but in the morning I found him asleep sitting up in an armchair with a sort of beatific look on his face. As I recall we set off on the morning tide to scout Monterey and Pacific Grove (via Moss landing where Peter hit a good shelf of poetry and bought some of them from an old lady bookseller who had never heard of Larkin, Betjeman or Heaney.) Last word to Geoffrey Hill for Peter -- from the 24th Mercian hymn - "'Et exspecto resurrectionem mortuorum' dust in the eyes, on clawing wings, and lips." Adios Peter - for the moment the great world of books feels hollow and flat without you. I am thankful that you made this post about Peter Jolliffe. Your description of him having a sweet nature is spot on and I always enjoyed talking to him in the shop in London. I had written to him just before Christmas as I had only just discovered the RS Thomas biography and the 'Collector'. Peter Jolliffe's funeral is at Islington Crematorium, East Finchley, London on Thursday, 10 January 2008 at 1.15 pm. Afterwards, I believe, at "The Plough" pub, his favourite watering hole in Museum Street, from 3pm to 6pm. I met Peter first in September 1956 when we were both nine year olds. He had indeed a sweet nature throughout his life -- quiet, determined, intelligent, moderate. In recent years I only saw him very occasionally in Ulysses but thought that perhaps life should have been kinder to him. I am at least glad that he was so widely and well remembered. Peace to his shadow! I HAVE ONLY JUST DISCOVERED HIS DEATH AND FEEL MISERABLE. i HAD A CARD FROM HIM LAST CHRISTMAS AND WAS ABOUT TO TRY TO OFFLOAD A NICE COLLECTION OF hENRY WILLIAMSON BOOKS I HAVE BEEN HAPPY TO HAVE OWNED. WE TRAVELLED TO SAN FRANCISCO TOGETHER AND EGYPT AS WELL AS TO NEW YORK AND SPENT MANY HOURS IN THE 90s IN THE SHOP. WHAT A LOVELY MAN SO SADLY MISSED.